A Bunda is one of the oldest, largest and most vital samba schools in Europe. 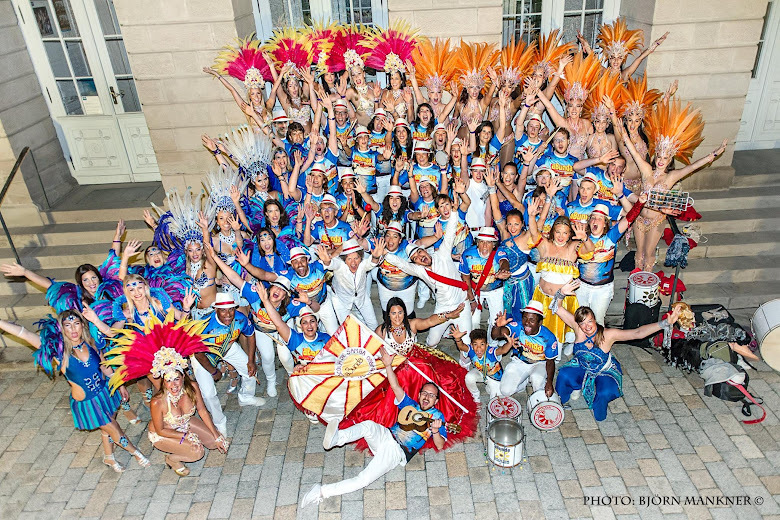 We have been performing at carnivals and festivals in Sweden, Denmark, Finland, Germany, France and Italy since 1984, and many of our more than 100 members have played or danced with groups at the Rio de Janeiro Carnival. In 2007 a delegation of 12 A Bundistas took part in the 2nd International Encontro do Samba at the Cidade do Samba in Rio, performing together with members of Curicica and Monobloco, and also paraded through the Sambodromo among the 2500 participants of União do Parque Curicica, the final group appearing at the last night of the Carnival. A Bunda took an active part in the first three European Encontros do Samba in Uppsala 1986, Åbo 1987 and London 1989, arranged and hosted the fourth Encontro in Gothenburg 1997 (with 600 participants from many different countries) and participated with a large delegation in the fifth Encontro in Villeneuve-Sur-Lot 1999.
also incorporate fire-eating, acrobatics etc. We also include elements of Samba Funk, Maracatú and other Afro-Brazilian music styles.